There is a growing interest in organic gardening and more people start their own garden in their backyard or even on a small patio. To succeed you have to start with a good soil and the Dr. Earth fertilizers we have found got some great ratings. Reason for us to dig a little deeper in this matter. Many of the non-organic fertilizers are only containing a few ingredients that are based on the NPK system. These letter stand for the ratio of Nitrogen, Phosphorus and Potassium. Bur there are no other nutrients in there that a normal soil contains. Things like minerals, calcium, pro biotics. Dr. Earth contains all these extras and that makes it in my opinion to the better choice fertilizer for vegetables and fruit. lets have a look at a few of the mos used Dr. Earth products. If you are gardening you probably also have a compost pile and if you do not have one you should start one. You can add most of your kitchen scraps and garden waste to it and this will make some great compost to add to your garden. One way to do that is using one of the compost tumblers we reviewed. 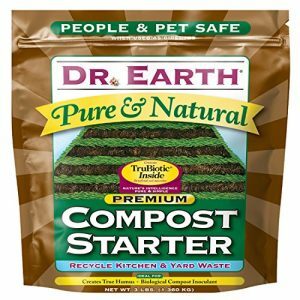 Dr. Earth has a compost starter that according to the many reviews I read can boost the working of the compost pile and give it a good start. It contains a lot of ingredients that will help like Alfalfa meal, seaweed extract and many microbes to help decompose the compost pile. The over 90% 4 and 5 star ratings confirms this statements. The most popular plant to grow in a garden is the tomato. Reason is that they are easy to grow and have some good nutritional values. 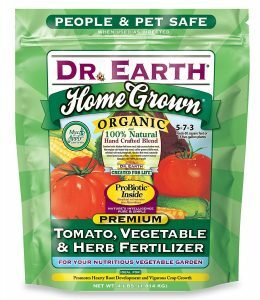 For a good harvest you need a quality fertilizer and Dr. Earth home grown vegetable fertilizer got ratings with and average of 4.3 stars. There are however 85% that gave it a 4 and 5 star rating. The ingredients are most of the time NPK like we wrote in the introduction. Dr Earth however contains a lot more. Some of them are bone meal, soft rock,fish meal and seaweed extract. All these so called trace minerals makes a world of difference according to the many people that used this tomato fertilizer and not just on tomatoes but on all kind of vegetable plants in their garden. CHECK THE PRICE HERE! Find the price here. This is what some people call a citrus fertilize but it is more than that. It is for all trees that bare fruit, nuts and berries. Most of these trees need the same type of nutrients and that is why it is called natural wonder fertilizer. 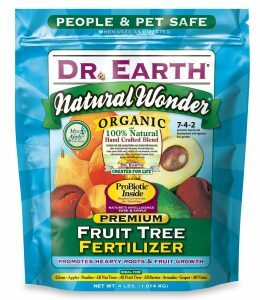 After reading a lot of the reviews I think it is safe to say that this organic tree fertilizer is one of the best to use on any fruit bearing tree. This product contains several strains of champions and a number of microbes and microbes that are all organic to help grow better fruit. A few people had tested plants with and without this fertilizer and mentioned that the ones with the fertilizer performed a lot better. Roses are the favorite plant of many gardeners but require a little more attention that most other flowering plants. There are many books available on how to grow roses and one of the things they all agree on is that it needs a good fertilizer to grow them beautiful roses. 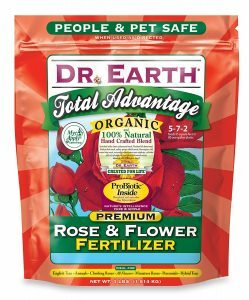 The Dr Earth rose and flower fertilizer contains thing that are generally not found in many other fertilizers. It would be a long list to mention them all here but a some of them are: cottonseed meal, fish bone meal and alfalfa meal. It also includes many pro biotics and soil microbes. This products is hundred percent organic and natural and according to the raters it is great and not just on roses but all other flowering plants. Dr Earth product line contains a lot more than the few organic fertilizers I have mentioned here and I can make a whole website just for that. Many people wonder where to buy Dr earth fertilizers and in my opinion online is the best solution. I don’t like to drag bags trough a garden center or nursery and put them in my car and come home and drag them out again. Online deliveries are a lot easier and in most cases cheaper. Buying online and off season is a great way to safe money on you organic fertilizers. Find them here! Find all Dr. Earth fertilizers here. 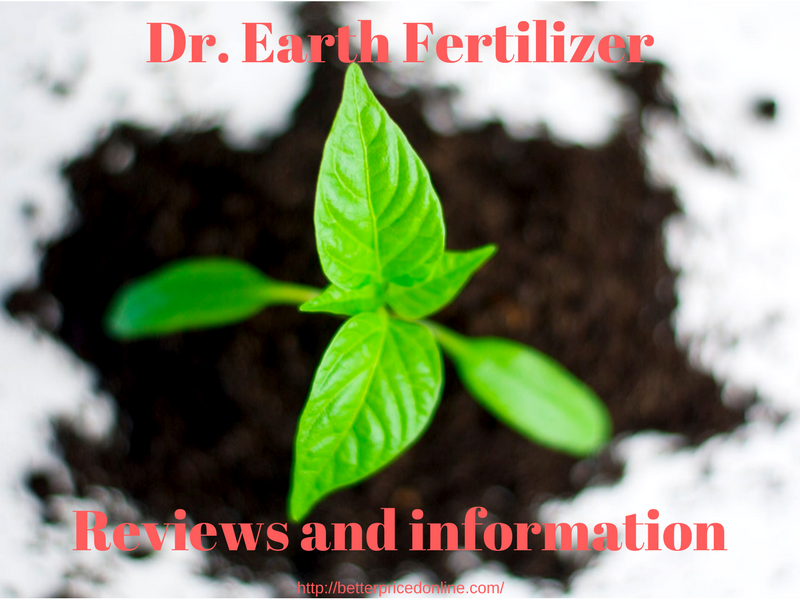 I hope you enjoyed these Dr. earth fertilizer reviews and if you have an opinion or experience feel free to leave that in the comment box below. If you are looking for different products have a look at our garden product reviews here.